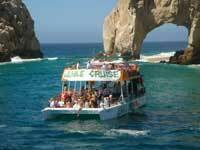 This is the daytime version of the legendary Cabo Booze Cruise! If you're looking to enjoy fun in the sun, snorkeling, bikinis aplenty, lots of drinking and fun time reggae and dance music, this is the tour for you! Enjoy the sunshine as you cruise to Santa Maria Cove, where you'll snorkel in one of the best snorkeling locations in Cabo San Lucas. Admire El Arco (The Arch) as you pass by Land's End where the Pacific Ocean and the Sea of Cortez meet, then enjoy a swimming stop in the beautiful waters of Pelican Rock or Medano Beach. You may also enjoy the Jungle Cruise by night with our Jungle Reggae Booze Cruise, or in whale season, our Jungle Whale Watching Tour. Tuesday through Sunday from 1:00 PM to 4:00 PM, from April through November only. From December through March, the Jungle Cruise runs their Whale Watching Tour. The Main Dock in Cabo San Lucas. Directions will accompany your reservation. Snorkeling Equipment and instruction, Light Lunch, Unlimited Open Bar, Party Music. All other dates are available.